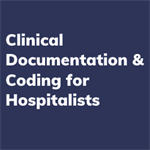 Clinical Documentation & Coding for Hospitalists offers hospitalists the latest information on best practices in coding, documentation and compliance from national experts. This program has been updated with all new content and provides eight recorded webinar sessions presented by expert faculty, downloadable resources and an interactive discussion forum through the Hospital Medicine Exchange (HMX), enabling participants to ask questions and learn the most relevant answers. CME credits are offered through an evaluation following the webinars. For group registration and pricing, please input the quantity needed in the shopping cart and check out. Then, complete and submit this form with the lead contact information and all the participants’ information. Please allow 2 business days after payment is received for all participants to receive access. 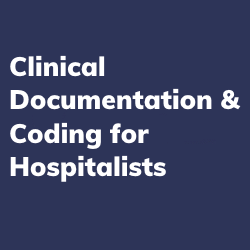 If you have a group of 75 or more please contact education@hospitalmedicine.org for discounted pricing. For individuals, please click here to be redirected to the SHM Learning Portal where you will be able to register, pay, and begin the series once logged in. If you would like to register a group please see the directions above.